At work a customer and her two young children stepped up to the cut counter with bolts of fabric. 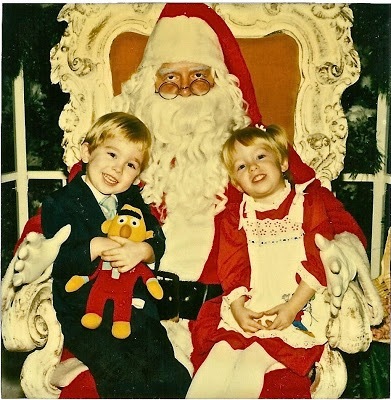 As I began to measure, I asked the brother and sister if they were excited about Santa Claus. They were quiet. Then their mom explained that she told her kids that there is NO Santa Claus. Whoa, whoa, whoa. . . As I cut her fabric, I smiled at the kids and told them that Santa is very real. I happen to know this for a fact since I was an elf and worked at the North Pole in the Doll House. I told them how every morning Santa came by and said good morning to all the elves. And how Mrs. Claus makes the yummiest fudge and gingerbread with whipped cream. And how the reindeer are real. I’ve seen them! At this point, Mom is giving me this odd look. . . so, I stopped and said, “Ah, you still don’t believe, do you?” Then I told her that I could take a lie detector’s test and pass with ‘flying reindeer.’ (It’s true.) A curious smile began to sprout on Mom’s face, and soon her little girl began to tell me about the Easter Bunny. My co-worker tossed in a good word for the Tooth Fairy. I could see the magic in the children’s eyes. Sooo much fun! BTW. . . 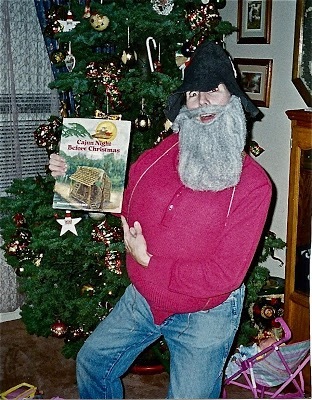 I REALLY was an elf and worked at the North Pole! Honest. So what can I say? Years ago Maria really did work at Santa’s Village! Jolly Old Saint Nicholas isn’t jolly in this picture. 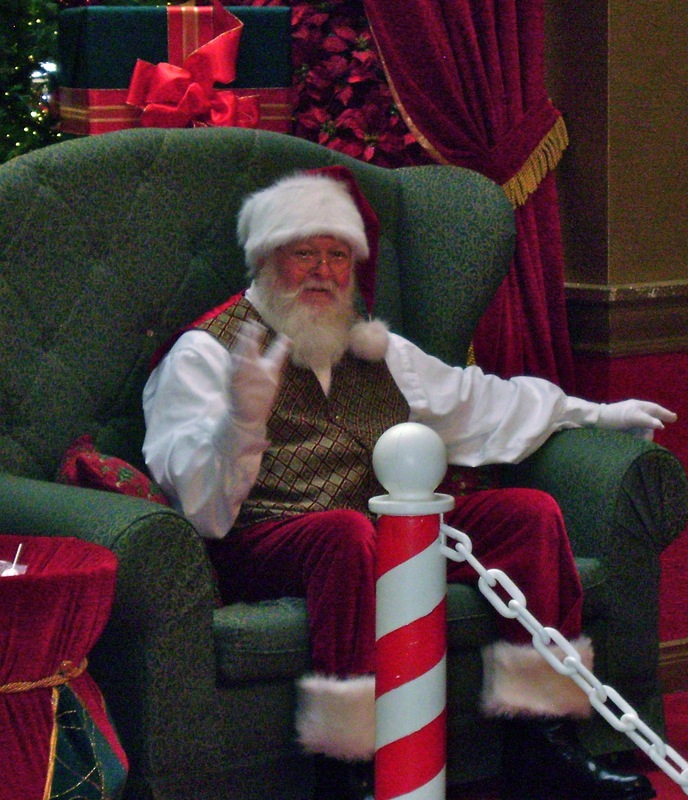 In fact, Santa looks downright bored. Why are his eyes droopy? Is he thinking that kids have cooties? Puck and Tulip when they were little. How can Burt go anywhere without Ernie? Tulip’s got the whole package! She was in the Christmas Parade with her Girl Scout Troop. wife of one of the three kings, for the school Christmas play. She opted to be a donkey instead! CAJUN NIGHT BEFORE CHRISTMAS by Trosclari. Kids of all ages get the biggest kick out of this picture book. So do adults. Such a fun read aloud! One year I read it to every grade at my kids’ school. I went to each classroom, from kindergarten all the way to 8th grade! The middle school kids enjoyed it as much as the little ones. This entry was posted in Holidays and tagged school play, Sugar Plum Fairy glass music, the whole package, Trosclari. Bookmark the permalink. 16 Responses to Santa is Very Real! I loved that story. No special plans, just a day when my Honey and I and both the teenagers all sit round the table at the same time and eat together :-)Merry Christmas to you Lynn. Fabulous fun-filled pics, Sarah! Christmas is an exciting time if you embrace the spirit, eh? 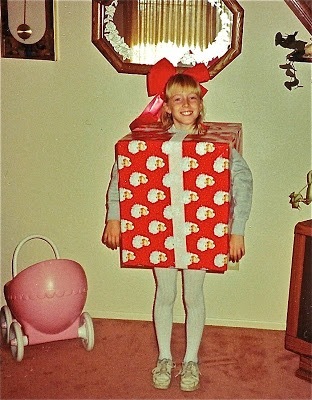 I'd have opted for the donkey costume as well.Have a very Merry Christmas! What a great story! I don't understand the parents who say they don't want to "lie" to their kids. How awful. I never thought my parents were LYING to me. Our daughter still believes in Santa. She's 7. I hope she never stops believing in the magic of Christmas. I wish I hadn't…but your story brought it all back to me. So thank you! And thanks for posting those pictures! Those are great! So Awesome!Have a very Merry Christmas to you! Details really make a story, and I loved the detail of how Mrs. Claus makes the best fudge and gingerbread with whipped cream. My Christmas is going to be extra special this year because my husband and I get to spend Christmas day with all four of my grandparents at our home. Since they're all in their 80s, we don't know how many opportunities we'll have like this. Merry Christmas, Lynn! That was a great story. :)Great pictures–and I love the Sugar Plum Fairy video.Happy Holidays! Just eating! Happy holidays, Lynn! That video was stunning – such clever people! As for Santa – I'm not sure what's up with him. Did he think he was supposed to be The Grinch?Hope you have a lovely Christmas, Lynn. Fabulous story – it brought a smile to my face :-)I love the photos too – thank you for sharing, dear! Sarah – That sounds like a really nice way to spend the holiday. Merry Christmas!Pat – Thank you! Yes, Christmas is extra fun when we view it all through a child's eyes.Old Kitty – How cool! Cheers to you and Santa!Stephanie – LOL! 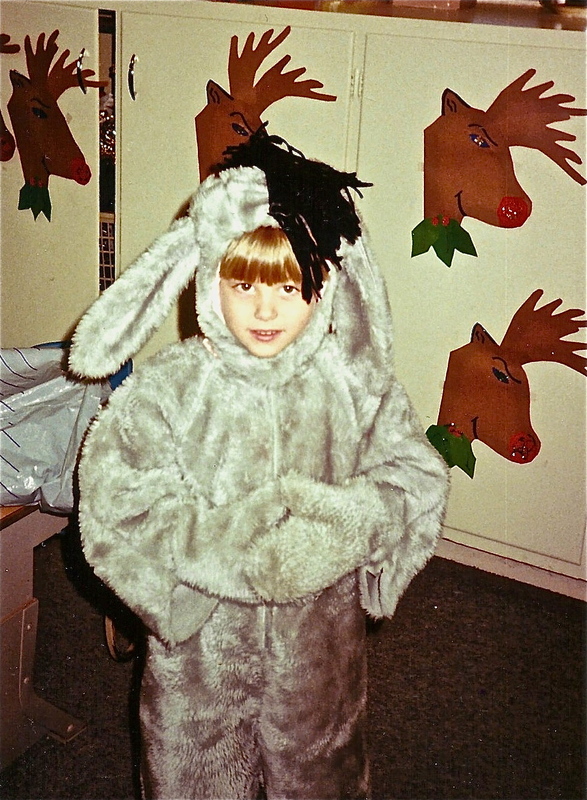 I'll tell my daughter that you would have picked the donkey costume, too. She'll get a kick out of that! April – Thanks for sharing your own experience. I was 8 when a kid on the bus spilled the beans! I didn't want to believe it! Haha! Eagle – Oh, thank you! I'm so glad you enjoyed The Sugar Plum Fairy. Being a ballerina, I imagine you've performed to that song before! It is a beautiful song.Nancy – Haha, I love the "just eating." One of my fav things to do, especially all the goodies for the holidays!Julie – Thank you! I'm glad you enjoyed the photos. Thank you for stopping by on such a busy day!C D – Yes, I think it's astounding that the glass music sounds so beautiful. Who woulda thunk? And that Santa, thanks for commenting. Very strange Santa for sure!Angela – I think you have a perpetual smile on your face! You always put a smile on my face, just looking at your profile pic!